This Old Life: Mad About Plaid! 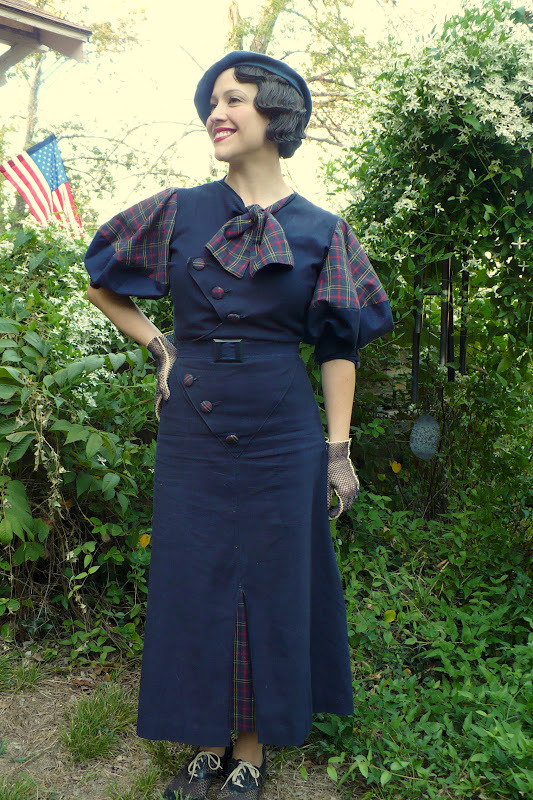 Love the diagonal lines of the dress and the covered buttons! What do I think? I think it is perfect! All of it! Oh my! That is something very special indeed! Love! I love this dress pattern and how you've made it, it is jaw-droppingly beautiful. Wow! There´s not much more I can say. The dress looks amazing and so do you. Love it! I think your added buttons yoke add so much to the design. I'm definitely adding this to my must buy pattern list! This is SO wonderful. So so so stunning! I'm envious of your incredible sewing skills, this dress is just perfect!! The new hair is impressive--as is the new dress! I love tartan! Oh my God, three weeks without internet. I don't know how I'd function. Very, very pretty. And love the waves! What a stunning dress!! I love the detailing, and I must say how amazing your hair is! Wonderful! 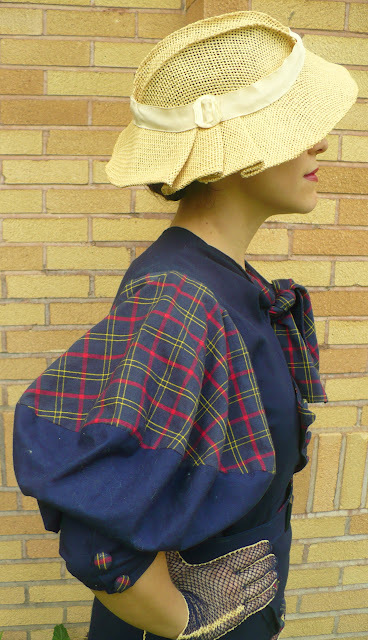 I recently purchased this pattern, too, but was second guessing myself as I was afraid it would look too costumey. Your version is absolute perfection and now I am envisioning it! Yours is so much cuter than the pattern illustration! Everything is simply scrumptious head to toe!! Wish I knew a seamstress, I too would have this dress in many combos. The hat(s) wonderful! The hair, job well done! That really is lovely. I think plaid is so classic! Oh, and I love your hair. I've recently decided to get my hair bobbed again. :) I can't wait! I so want to try finger waves! 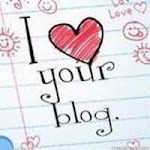 Your blog is so fantastic and a great result on this latest effort! Congratulations! 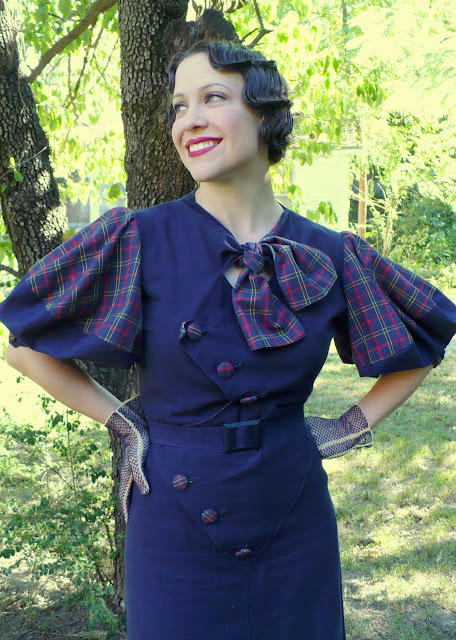 Now, I must go ahead and break out one or two of my retro patterns I've been neglecting, stat! Love, love, love everything - the dress, the hair, your blog. :) I absolutely loved Henrietta's clothes in The Hollow, too. I'm your newest follower. Your fingerwaves are spectacular!! I'm in awe! 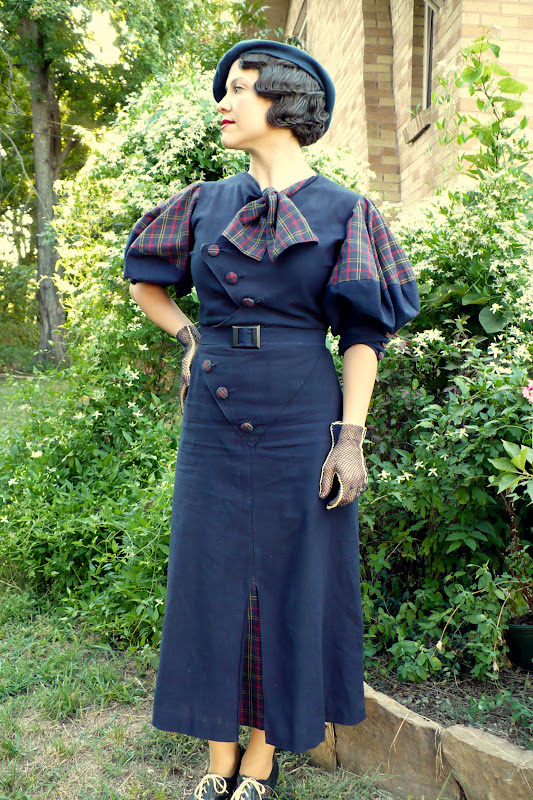 That dress is equally fantastic; the sleeves and the buttons are just too great! Incredible! Everything looks fantastic... the dress, the hair, the hat... love it! Great work. This is breathtaking. Very well done!!! Your hair is amazing! So perfect with the hat. and the dress is beautiful too. What a great look. This dress is executed beautifully:)you look fabulous. I love the plaid/navy blue combination. your hair finishes the outfit off perfectly! Oh, no, this is so gorgeous i nearly feel sick! It's perfect, and soo well-made. Hair is just perfect. Wow! Thank you, everyone! Lauren, please do make up this pattern; I would love to see what such a talented seamstress would create! As for the dress looking costumey, I had the same concern. I found that when I tied a big bow at the neckline as shown on the pattern, I felt a little ridiculous; letting the tie hang down feels much more natural. The huge sleeves are my favorite part, but they definitely took some getting used to! I would love to make this again using crepe or something more drapey; I think that would change the look of it completely. 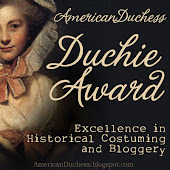 Just discovered your blog-- your creations are fabulous! I love your hair and always wondered how that style is achieved. Do you have any tutorials? It looks amazing! What an amazing dress! And your fingerwaves too..how do you do that? If you do have any tips I'd b every happy to hear them - I can never get my waves right! Wonderful. I've always wanted to make this dress.